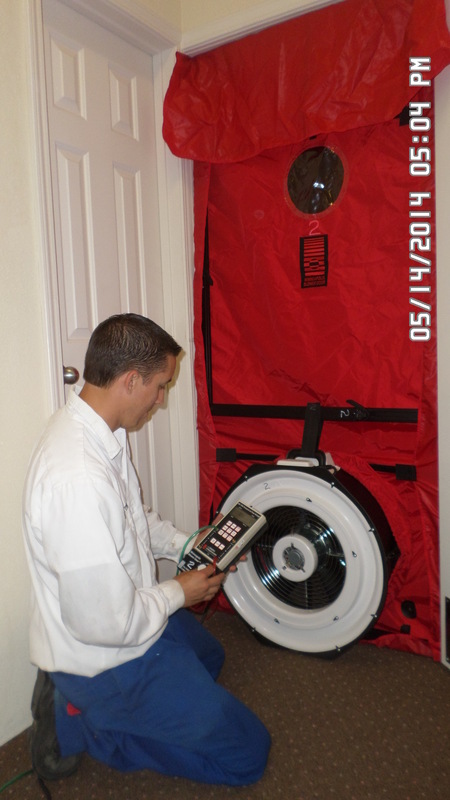 Home > Energy > Cool Davis Partner: Greiner, Heating and Air, Inc.
During an energy audit, one of Greiner’s BPI certified technicians takes measurements and calculates a home’s energy usage and loss. The technician shares the information with the client and offers recommendations for ways to maximize efficiency, meet comfort needs, and save money, too. In order to give money back to members of the community for investing in energy-saving improvements, Greiner developed a relationship with Build it Green, an Oakland based non-profit that specializes in the Quality Maintenance, Energy Upgrade California, and rebate processing for PG&E. 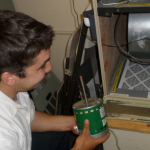 For example, Greiner is able to offer direct savings to service clients when they upgrade their furnace motor through the PG&E Quality Maintenance Program. 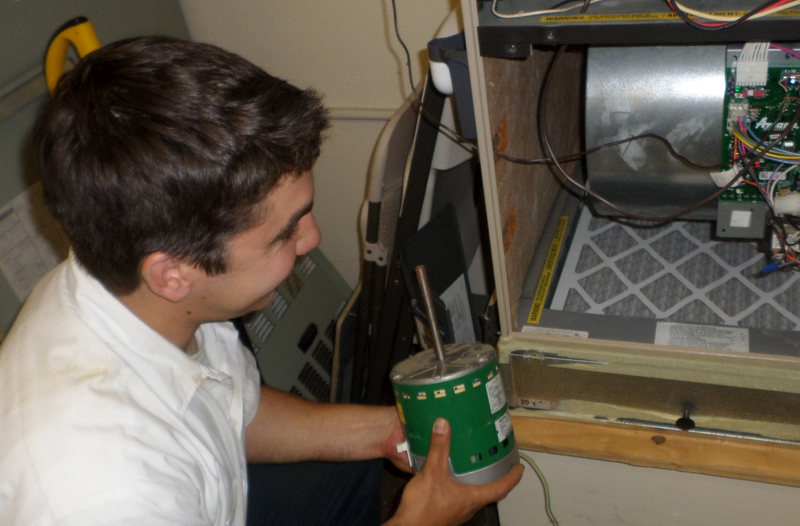 Greiner BPI certified tech Alex installing energy-efficient blower motor in furnace for PG&E customer under the Quality Maintenance program. In addition to a reduction in greenhouse gas emissions, the client who installs a high efficiency motor may qualify for a PG&E rebate and instantly receive $300 in credit toward the cost of the motor. Since May of 2013, the company has facilitated a total of $40,350 Quality Maintenance rebates for their clients. With regard to solar electric installation, insulation, and tankless water heaters, Greiner has helped Davis area clients decrease their energy consumption by an approximate total of fifty-eight thousand kilowatts per year and four thousand, eight-hundred natural gas therms per year. These same clients have been awarded a total of $91,000 in incentives through the Energy Upgrade program. Also, clients that install a tankless water heater in combination with a recirculation pump can cut their water usage significantly. The average reduction is about seventeen thousand gallons per year per household. Greiner helps clients reduce ghg emissions. Cool Davis is pleased to welcome Greiner as a Partner. Through its work, the company carries out the mission of Cool Davis home by home as they help their clients reduce greenhouse gas emissions, adapt to a changing climate, and improve their quality of life. Way to go, Greiner Heating, Air, and Solar!